Simple maternity sessions at home can be oh-so-sweet. I feel like you’re guaranteed to get something different than the norm. It’s the type of session that you can personalize just by being in your own home environment. And when this sweet boy walked into the room, bed-head and all, I absolutely loved it. Fun fact: I knew this couple well before they were married. We go way back to an old youth group/church group we all participated in every week, way back before either of us were married or had children of our own. They fell in love as teenagers, overcame SO many trials over the years, and now are POWERFUL couple that encourages youth at their own church today. I love seeing people grow together! 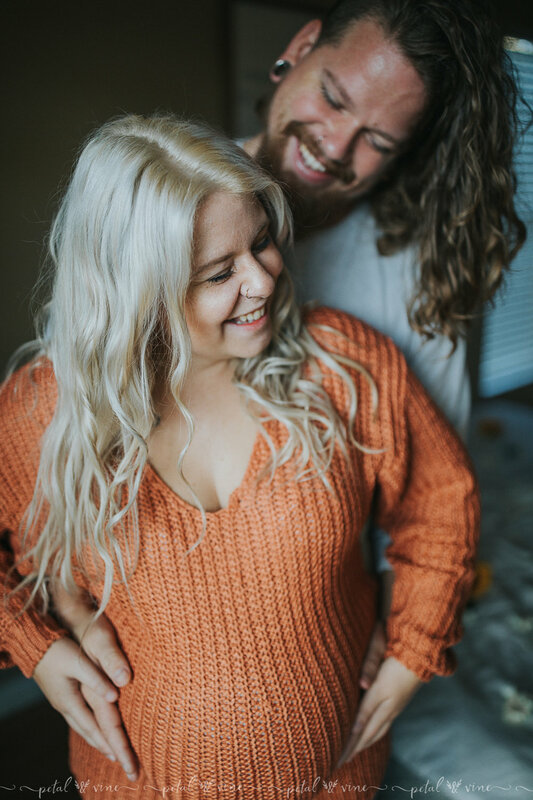 I took their first maternity photos with this handsome fellow a few years ago; It was an honor to photograph this mama again as she prepares to welcome another son. Here are a few from their in-home maternity session….enjoy! If you're interested in a family or newborn session in the greater Central Florida area, such as Lake Wales, Winter Haven, Lakeland, Dundee,…or a session in the Bradenton, Sarasota, and Palmetto area, feel free to contact Petal & Vine Photography and follow our Facebook Page.